Fangame: The Game: The Forum • View topic - Help design a level for Fangame! Help design a level for Fangame! "My designs? In Fangame?" It's more likely than you think! Without trying to make this TOO formal, let me explain my idea. 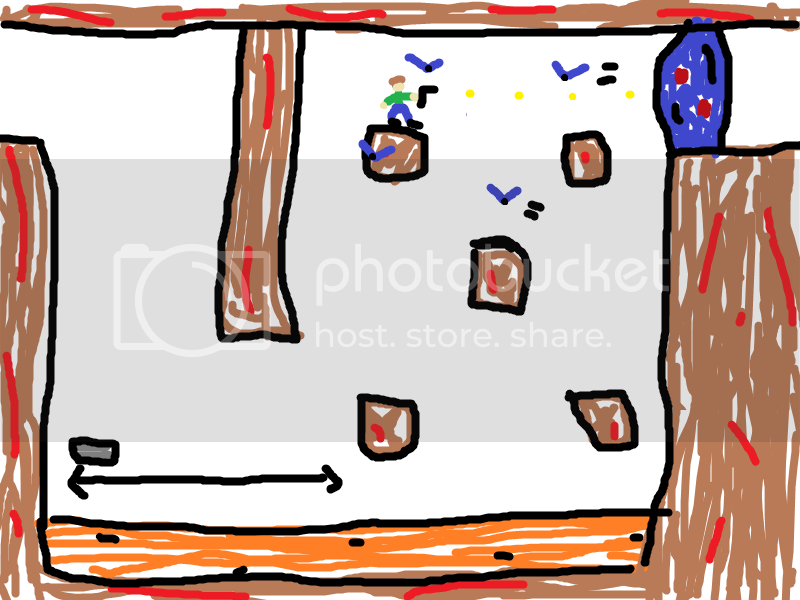 I want to design a level in Fangame that is made up of rooms designed by players like you. 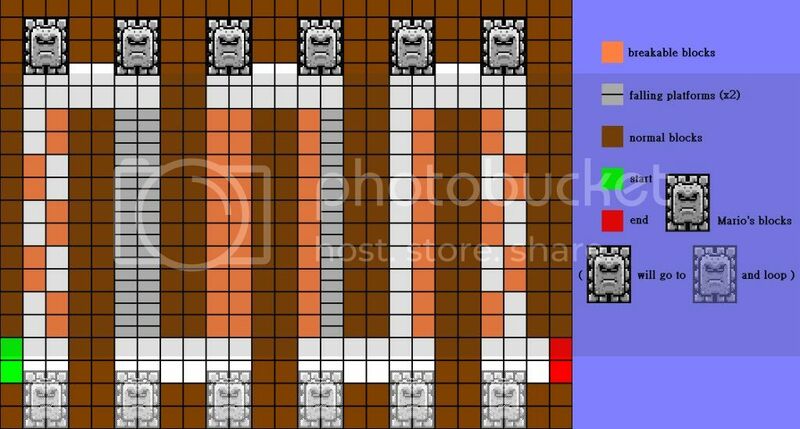 Basically, all you would do is come up with the design for a room, including any traps or puzzles you want in it, submit your design to me, and once I have enough rooms designed by people I will put them all together to form one whole level. 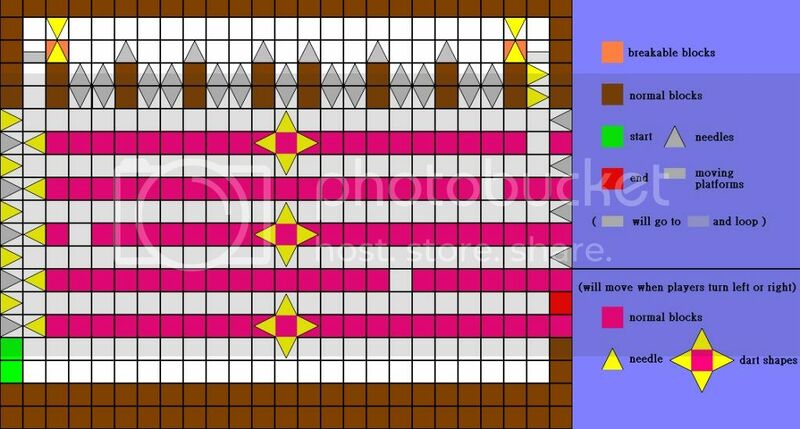 You may be wondering how you are going to design a room if you don't have the software I am using to make the game. The answer is simple, actually. Just draw it out. Use whatever drawing programs you have available to you and simply draw out your design. Use MS Paint if you have to. Heck, you can draw it on a piece of paper and scan it. As long as I can understand your design, it should be okay. I will have a deadline for when all designs must be submitted, but I'll come up with it later. - The room cannot be more than 800 pixels wide and 600 pixels tall. It can be smaller, if you prefer, but never larger than 800x600. - Be sure to write out and explain how any traps and puzzles will work in your room. Explain them clearly so I can understand them and design them the way you have intended. - Fangame uses a tile size of 32x32 pixels as a standard. This info might help you, however, you are not limited to this tile size. When I recreate your design to be put into the game I can use just about any wall thickness, shape, color or pattern that you want me to. - Do not draw slopes into your design. Fangame's engine does not support walking on sloped surfaces. Make sure you specify where everything goes and what they're supposed to do. Remember that the player can shoot upward but not downward. I've already typed more than I planned to type tonight. I know this post can use a lot of cleaning-up, but I'm too tired to care about it right now. I just wanted to let everybody know the basics. If you have any questions that will help you design your room, please ask them in a reply to this thread. 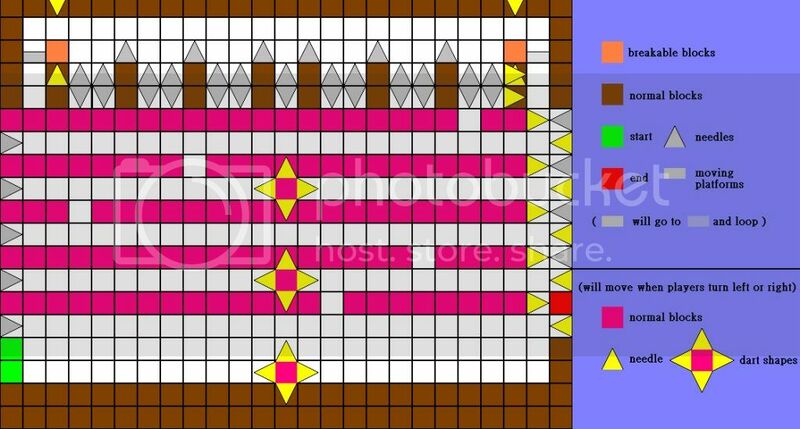 Re: Help design a level for Fangame! Excuse me , the Mario's block has a face could be hampered by falling platforms or breakable blocks ? might give this a shot....any preference on entrance/exit locations? Okay I have arequest that I think you could do or grab some inspiration. - Gunstar Heroes - "Seven force" ...If you can manage to make a working reference or boss I would love you long time...oh mega nostalgia! I was really tired when I typed the original post here, so it's not very well explained or organized. At this point I'm not going to promise anything. I might be able to get this idea to work, but I'm not sure yet. I have designed three rooms for fangame . In this room have to notice that whenever you go down , remember to retain the way to go back up , because of "Mario's blocks" let you can't go down in once time . When players turn to right . When players turn to left . There are something will move when players turn left or right in this room , it has similar room in the fangame . Specially , at the high place of this room has a wrong way (trap) that you pass trough it but cannot go down . 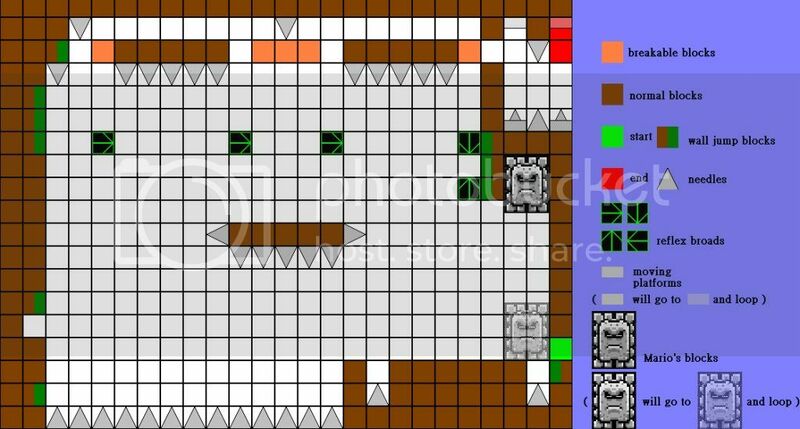 I do not have set any save in all three room , if the room would be used in fangame , please set the save in white check on the picture . WOW, dude. Just... wow. If everybody was as specific and detailed as you are, this would be a piece of cake. Your english is a bit difficult for me to understand. I'll have a look over these later but I'm gonna have some questions. There are mithing in breakable blocks. By the way,I don't know that bullet whether have enough time to hit all breakable blocks or not. Wow! Very nicely laid out. Hmmm... let's try to step away from the Amper Sands theme since it was already such a big level. I can implement the same basic designs using a different tileset. We'll need to work over some of these designs, though. There are a few areas that I can see would be impossible. I'm too tired to discuss them in detail now, though. Oh, and Denots, I'd prefer if each person only submitted a design for a single room. Oh...I see , and I feel room THREE is better than ONE and TWO , so I select it to represent my room . I have found there are some wrong in my room , so I modify it . This jump right here is impossible (or nearly impossible). Even with the breakable block gone, you wouldn't be able to jump off of the vines at a low enough angle to avoid hitting the spike. If the spike were up a little higher, it would be doable. This would also be impossible for the same reason stated above. The only difference here is that you'd be upside down. And I'm really not sure how this would be possible at all. Also, yuybill, I've been looking at your room design and even though I see where you're supposed to go, I'm not sure where you're supposed to shoot.